If God in His infinite mercy and meekness can be so much provoked by his creatures to the extent that he one day decided to destroy everything on the surface of earth with flood, then how much more can a mere human being absorb or withstand the wickedness of his fellow being? After the infamous Biafra genocide that occurred in the late '60s popularly known as the Biafra War, a lot of people feared that the Biafran remnants of the bloody genocide may not live to "survive the peace" as rightly expressed by the renowned literary icon, Cyprien Ekwensi in a novel he wrote about the war. Many anticipated that despite the "No Victor, No Vanquished" resolved by the Nigerian government and Biafra warlords, Biafrans still stands at the risk of being annihilated by Gowon's Nigeria military who are already trained and accustomed to killing of innocent civilians, fueled by the fact that they were at an advantage, considering that a lot of ammunition still abounds in their possession, unlike the helpless and almost toothless Biafran veterans who had laid down their ammunition with respect to the "no victor, no vanquished" declaration. The anticipation of many soon developed into a reality as the Nigerian military flooded the entire Biafra land, with the psychology of a warlord stepping into a conquered territory. My Grand-Mother (now late), narrated how a lot of post-war killings, rapes and numerous abuses took place. It was a horrible experiences that seems to have glued to her memory. The situation became worse as days go by, as the Nigerian military made life unbearable for Biafrans who survived the horrors of an unfinished extermination of the entire Biafra race. However, there came a time when the people decided that enough is enough, well depicted in a story narrated to us by a Reverend Father who served as our Igbo Literature teacher in the High School, and which I’ve investigated to be a non-fiction. Somewhere in Imo state, precisely in the suburbs of Ideato, the people resolved that it is time to send their oppressors packing...and the wisdom was not farfetched. There is a special natural wine in Biafra land that has some significant cultural values and importance to festivities and entertainment of guests. With the unnatural technological wisdom with which Biafrans are endowed with, they are able to drill/tap out this wine from the palm tree for their refreshment. Meanwhile, seeing that most members of the military has fallen in love with this wine, which they always forcefully extort from the tappers and farmers, the locals agreed to be producing two types of the palm wine- one for themselves, and the other 'exclusively' for the rampaging Nigeria military officials, and they tagged the wine as "MMANYA NDI ARMY"(WINE FOR THE ARMY). 'Mmanya-Ndi-Army' is an artificially made palm wine, but is very similar in taste and colour to the original palm wine gotten from the palm tree. Being novice to the disparities, the army officials are always given the parody wine whenever they storm the houses of the people for the natural refreshment. With time, the number of military officials began to reduce drastically. After consumption of their exclusive, many fell ill ranging from one form of sickness to the other. Due to lack of medical facilities in Biafra land, a lot of them were flown out of Biafra land for medical treatment. When others began to read meaning into the latest development, they took to their heels and left the area, while the people heaved a sigh of relief from their parasitism. Having come to terms with this interesting story, one would come to conclusion that the power of unity and will of any populace against any power that be, is indefatigable. Sadly, Nigeria is not a good student to history. Today, the Nigerian government and their genocidal military are still hell bent on accomplishing their mission of wiping away every living thing in Biafra land. Isn't it pathetic and horrendous that after the revelation by Amnesty International on the extrajudicial killings of more than 150 Biafra activists by the Nigeria security agencies, the Nigeria Army went ahead to launch a deadly operation code named- "OPERATION PYTHON DANCE" in the Igbo speaking part of Biafra land, in the name of curbing criminal activities during the Christmas period celebrated widely across Biafra land, the fact that the region is one of the most peaceful in Nigeria presently. One begins to wonder why the Nigeria military are staging a coup against the Nigeria Police Force who has the constitutional responsibility of ensuring internal security and orderliness across the country. The Indigenous People of Biafra are not in any way related to terrorists, neither are they affiliated to any radical group, unlike what has is being experienced in Northern part of Nigeria. The priority of Nigeria Army should be to get rid of terrorists and insurgents such as Boko Haram and Fulani herdsmen, and not launch a genocide-intent operation against non violent people such as Biafrans. 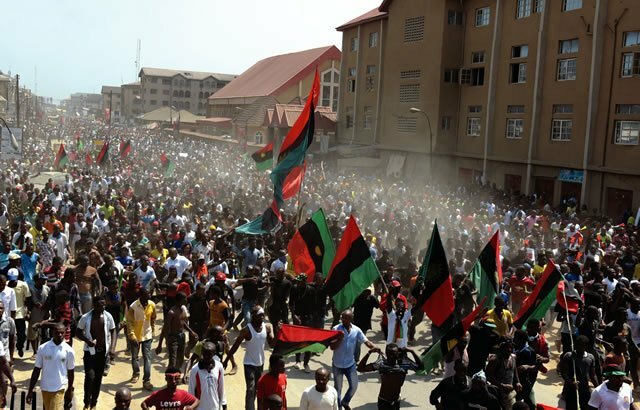 The number of military personnels deployed to Biafra land cannot in any way quench the resolve of Biafrans to restore the sovereignty of Biafra, instead it will end up proliferate unnecessary tensions across the region, which may force the people to defend themselves from possible annihilation by any means possible. The British government which ensured the manufacture of Nigeria, were not a novice to the dangers of suppressing the right to self determination of the people, hence they allowed for Scottish referendum few years ago, and also allowed for a Brexit referendum earlier this year. They did not role out armoured tanks to kill their people for invoking their right to self determination; neither did the government launch 'Operation Python Dance', or 'Operation Crocodile Smile' to extinguish the demands of the people. Therefore, there is an urgent need for the Nigerian government to demilitarise Biafra land, because this intimidation and silent genocide may not be tolerated for long.